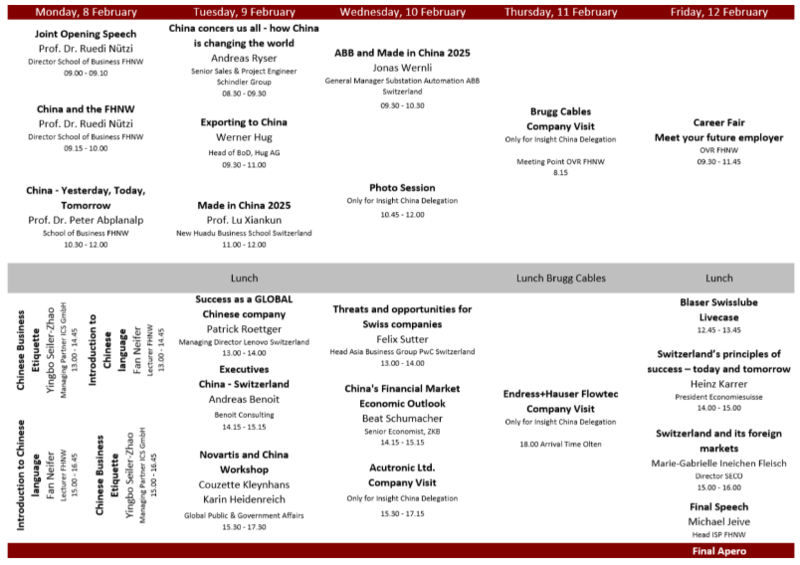 The first highlight of this year’s edition of Insight China – the Preparatory Seminar in Olten – will start on 8 February and run until 12 February, 2016. Our program looks very promising and we are looking forward to presenting some details to you. The focus of the first three days will be on presentations and speeches from sponsors and partners. 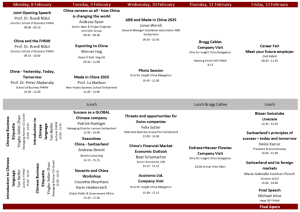 Delegation members and course participants will receive various inputs and be active in workshops around the topics of Chinese culture, China’s economic development and perspective, this year’s topic “Made in China 2025” as well as learn more about expanding to the Middle Kingdom. This week will be the ideal preparation for the On-site Seminar in spring 2016. On Wednesday afternoon is the kick-off for the first of three company visits. We will visit our sponsor Acutronic, as well as Brugg Cables and Endress+Hauser on Thursday. The final day is organised jointly with Insight China’s sister projects, Focus India, connectUS and exploreASEAN. We will have a career fair in the morning where all participants have the chance to interact with their potential future employer. This interesting week will close with the elaboration of a live case of our Main Joint Partner Blaser Swisslube. This will be followed by the speeches of this week’s key speakers, Mr. Heinz Karrer, President of economiesuisse, and Mrs. Marie-Gabrielle Ineichen-Fleisch, Head of SECO. After a short closing speech, we invite our partners to an apero. The team is very much looking forward to the Preparatory Seminar. We kindly thank our sponsors and partners who support us and help to make Insight China a success for 15 years.